Pests intrusion into homes is a concern for all homeowners. The possibility of sharing your space with wild creatures can strike fear into the hearts of even the strongest. A very common animal nuisance is the bat. Bats have sought shelter in human homes since man dwelled in caves. Even with the structural advancement of houses over the centuries, the persistent winged pests have found access to homes of all types. The obvious cure is to avoid the intrusion in the first place. For those who have unwillingly lost that first battle, there is still a way to rid yourself of the of these pests in a safe, ethical fashion. Bats are fairly misunderstood animals due to social myths and stigmatization. Beliefs that they’re like rodents or are “vampires” are the most common. Vampire bats as a whole exist in parts of Central and into South American. The resemblance to rodents is only that — a resemblance. Bats fall into a completely different grouping of species. Bats are not naturally destructive to the home like rodents are, and are known for being clean, well-groomed creatures for the most part. However, bats can still pose a problem to humans. The main problem comes from their feces (referred to as guano for bats) collecting in attics causing odors and other possible side effects. Bats can also carry disease, making contact with humans a possible hazard. 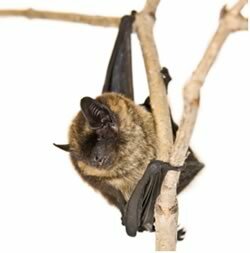 If you hear bats in your attic or see evidence of their presence, the first course of action should be to contact a pest removal specialist. Their experience and expertise will give you the best chance of complete and ethical removal and cleanup. The most common practice for the safe removal of bats is exclusion: keeping them out. To do that, the specialist will first determine how the bats are getting in and out. This involves a visual inspection of the house, and watching for entrances and exits during dawn and dusk. After holes and access points are located, the specialist will seal up all the known entires except the most heavily trafficked hole. The exclusion device will be constructed and installed here. This creates a way for bats to leave the home, but not re-enter. Exclusion devices come in many forms, from plastic tubes to metal screens. Once installed, you and your pest control specialist will need to wait until all bats have left the attic — usually, one to two weeks. Bats do not all leave at the same time or on the same night, so patience is needed. Once the bats have left, the exclusion device can be taken down and the last hole will be sealed to keep bats out. To keep bats out in the future, you can install a bat house in your yard. This gives the bats an easier option for roosting and keeps them around to help control bug population.